Through the In Depth with ESPERA series, Mary’s Pence will be sharing the history and stories of each ESPERA partner organization, one at a time. Grupo Emprendedor la Epifania (Epiphany Entreprenuers Group), better known as Epifanía, became an ESPERA partner in September 2012. The group consists of 26 women who attend the Divina Misericordia parish in a suburb just outside Tegucigalpa. Mary’s Pence connected with this parish through their sister parish in the United States, Epiphany Catholic Church in Louisville, Kentucky, whose congregation has supported Mary’s Pence for more than 20 years. The youngest member of the Epifanía ESPERA group is now 33, and the oldest is now 61. Their businesses include selling clothes, shoes, food and household items and providing transportation. The seed contribution from Mary’s Pence into Epifanía’s community lending pool was $3,500 in September of 2012. Six and a half years later, the 26 members of Epifanía have distributed 156 loans amongst themselves with a cumulative total of $61,670. As loans were repaid, the women also collected interest at a mutually agreed-upon rate, resulting in $4,000 of interest paid into the community pool. This interest added to the lending pool, increasing women’s opportunity to receive loans. This means that the women of Epifanía have received a monetary benefit 17 times greater from participating in ESPERA community lending model than if Mary’s Pence had given them a grant or if they had to pay back their loan to Mary’s Pence. And that doesn’t even take into account the non-monetary benefits of participating in the ESPERA program. 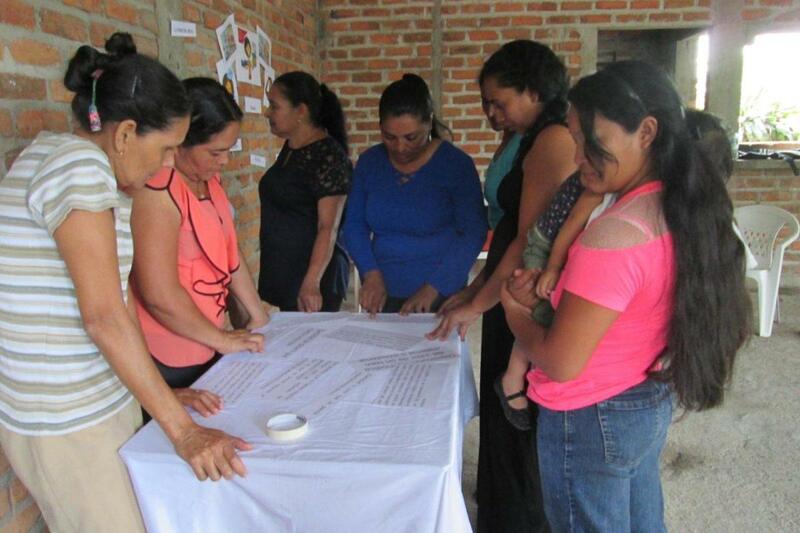 Women from Epifanía have participated fully in many capacity building opportunities provided by the ESPERA program. They work primarily with ESPERA promoter Eva, who travels regularly to Honduras from her home in El Salvador. She provides business and personal coaching on a variety of themes. One notable workshop she facilitated with Epifania was called Rio de la vida/River of Life, which enabled the women to reflect on their life and set goals for the future. Epifanía members have also met other ESPERA participants from across Central America. They were represented at both the 2013 Encuentro gathering in Guatemala and the 2019 Encuentro in El Salvador. Not only did these gatherings provide the experience of travel and connection with women from other countries, but it also meant that Epifanía members were part of creating ESPERA. Both gatherings were opportunities to reflect on how far they have come and envision where we can go next, together. Members of Epifanía also participated in the recent Mental Health workshops funded by Mary’s Pence. 6% of the population lives in extreme poverty (less than $2.50/day). 3% of households are headed by a single mother. Learn more about the ESPERA Program.